Easter is definitely one of my favorite holidays. I love everything about the holiday: the festive baskets, the pastel colors, the beginning of spring, and of course, the delicious food. Today I will be sharing a fun twist on a classic Easter meal, because after all, when I’m entertaining family & friends, I like to put my own spin on things. These Hatfield Smoky Balsamic Pork Loin Sliders are made with a Hatfield Smoky Balsamic Dry Rub Seasoned Pork Loin Filet. 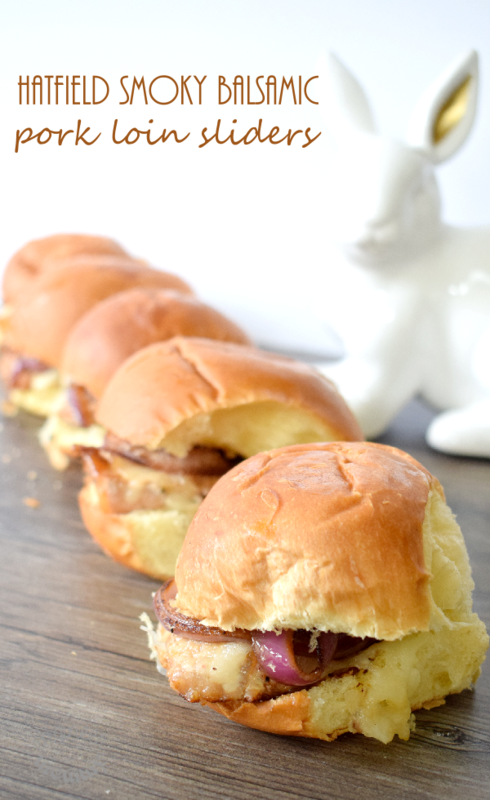 The sliders are easy to prepare, totally delicious and guaranteed to please a crowd. Our current home has a generously-sized dining room, which I absolutely love! Why? Because it means we can host major holidays at our house (our previous residence was a small townhome with a tiny dining space). Entertaining family & friends is one of my favorite things ever. I like to create a diverse menu of fun, unique dishes. I like to set the table for the season with cute embellishments and personalized details. I like to sit back & chat with the people I love. Entertaining is really so much fun! And I cannot wait to serve these Hatfield Smoky Balsamic Pork Loin Sliders at our Easter gathering this year! Keep reading for the full recipe. 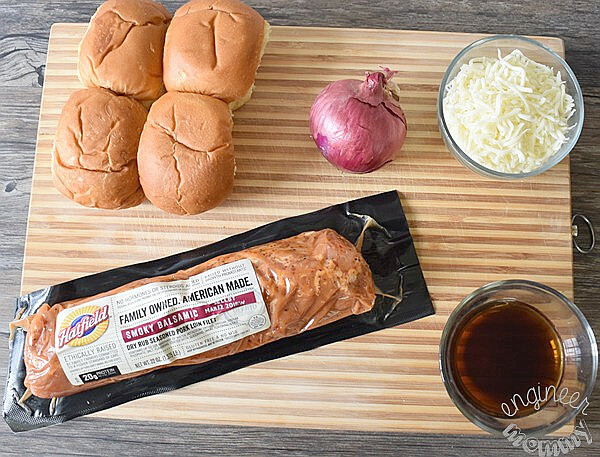 Gather the ingredients you’ll need: Hatfield Smoky Balsamic Dry Rub Seasoned Pork Loin Filet, shredded mozzarella cheese, red onion, slider buns (or small dinner rolls), balsamic vinegar and brown sugar. Start by cutting 1/4 inch slices from the pork loin. Place the slices of Hatfield Smoky Balsamic Seasoned Pork Filet on a frying pan over medium heat for 6-8 minutes on each side, until cooked throughout. Then flip the slices. The filet should reach an internal temperature of 145°F or juices run clear. 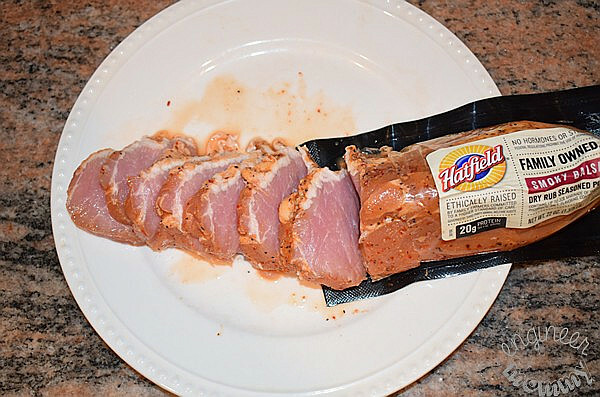 Since Hatfield Pork Loin comes pre-seasoned with a dry rub, this meal comes together in no time! 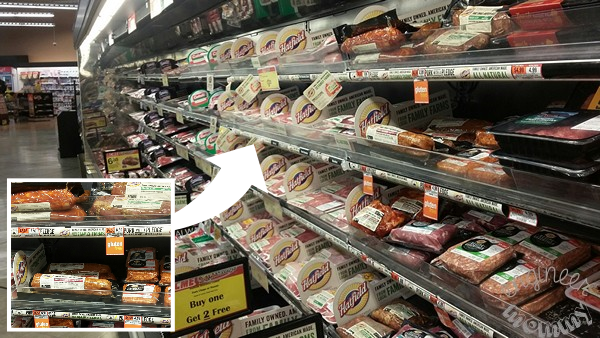 Click here to find Hatfield pork at a retailer near you. Meanwhile, combine balsamic vinegar and brown sugar in a small saucepan. Bring to a boil and then reduce to a simmer. Remove from heat once mixture has reduced in volume by half. Now it’s time to assemble our sliders. Start by spreading some of that delicious sweet-tart balsamic glaze directly on the slider bun. Place a slice of the pork on top. With Hatfield Dry Rub Pork Loin Filets, these sliders are super flavorful and incredibly easy to prepare. Add a generous heap of shredded mozzarella cheese on top. Let the heat of the pork loin melt the cheese. Isn’t melted cheese a beautiful thing? 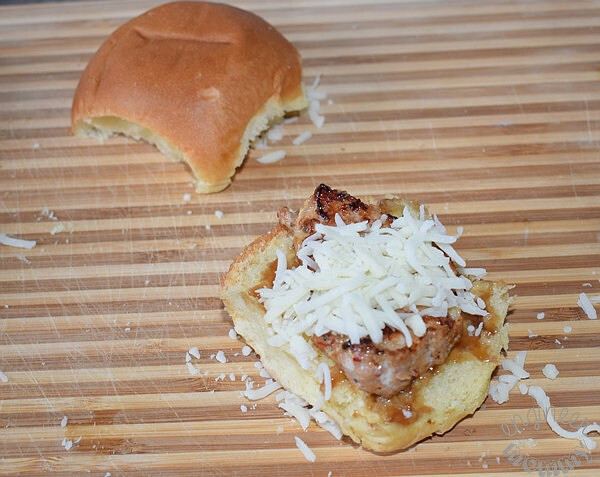 *TIP: If your cheese doesn’t melt from the heat of the pork, here’s a quick shortcut: place the slider in the microwave for 20 seconds. Slice a red onion thinly and cook in the pan for 5-10 minutes. Top the slider with some of the caramelized onions. And voila… the slider is ready to enjoy! 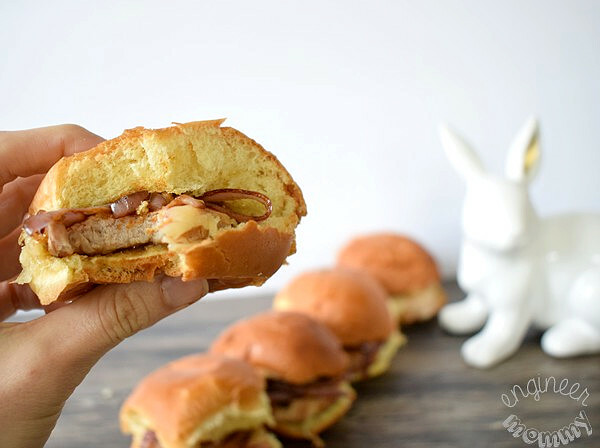 Prepare a whole batch of these delicious Hatfield Smoky Balsamic Pork Loin Sliders for your Easter gathering this year. I love that Hatfield Quality Meats is one of Pennsylvania’s heritage brands…it’s American-owned and well-respected for its high quality products. 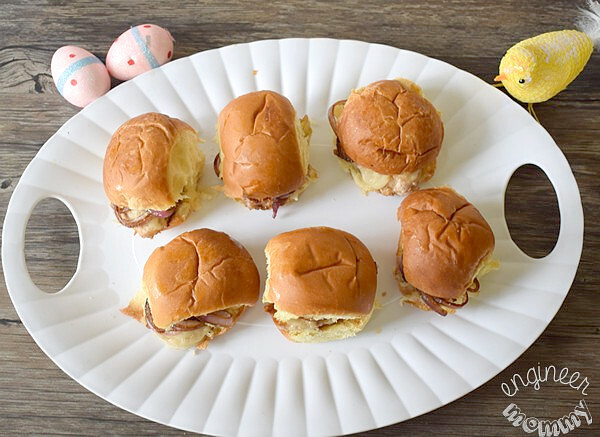 These sliders are sure to impress a crowd this Easter! Did you know that Hatfield’s Pork With a Pledge is ethically raised with no hormones or steroids added? 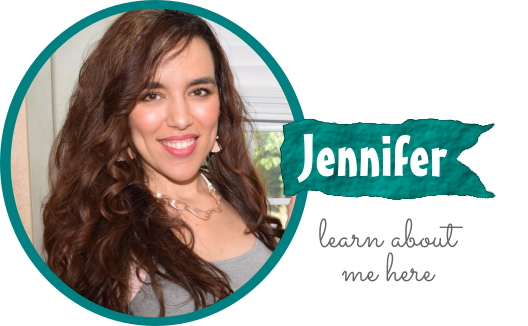 That is something I definitely appreciate, as I am making an effort to be more aware of everything that goes into the food I serve my family. 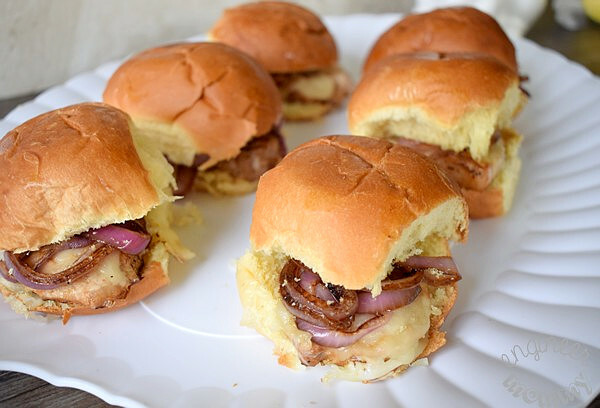 These sliders strike the perfect balance between the smokiness of the pork, the sweetness of the caramelized onions, and saltiness of the cheese. Take a bite and see for yourself! 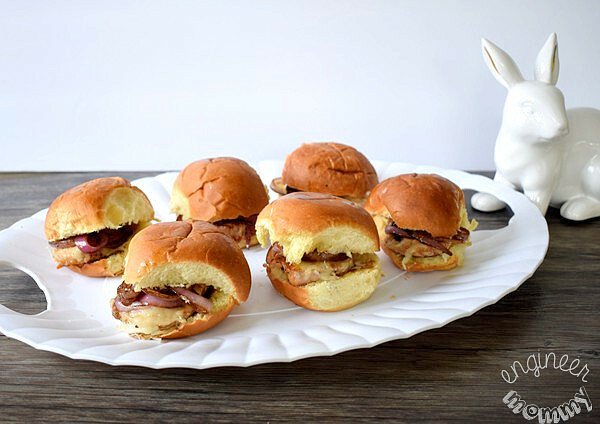 If there are any leftover sliders after the Easter festivities have ended, simply re-heat them in the microwave for a quick, convenient lunch the next day! I picked up all the ingredients for this recipe during a recent shopping trip to ACME Market. Be sure to look for Hatfield products at your local ACME Market. To keep up with the latest from the brand, visit them on Facebook & Twitter. Pick up Hatfield Pork from a retailer near you and be sure to try this recipe for yourself. Do you have any special plans for Easter this year? 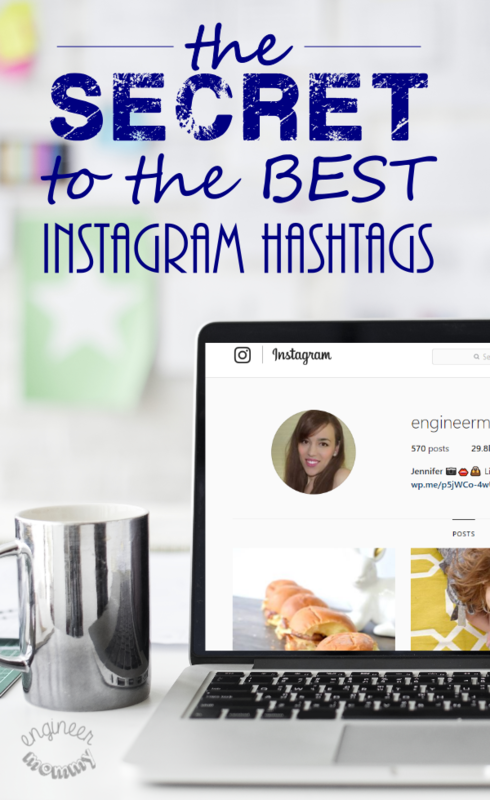 Do you love hosting major holidays? 1. 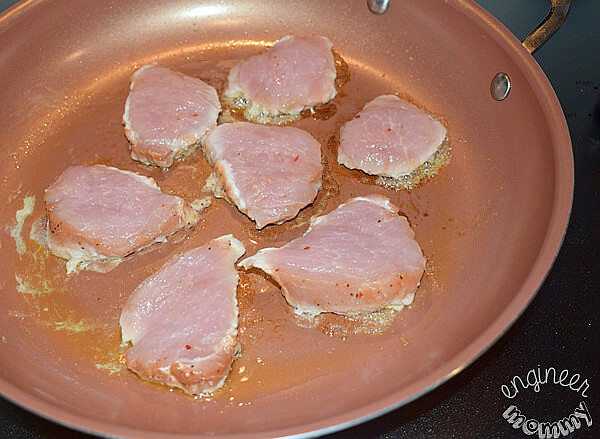 Place the slices of Hatfield Smoky Balsamic Pork Loin Filet on a frying pan over medium heat. Cook for 6-8 minutes per side (or until cooked throughout) and flip. 2. Cook the thinly-sliced onion in the same frying pan until soft & translucent. 3. 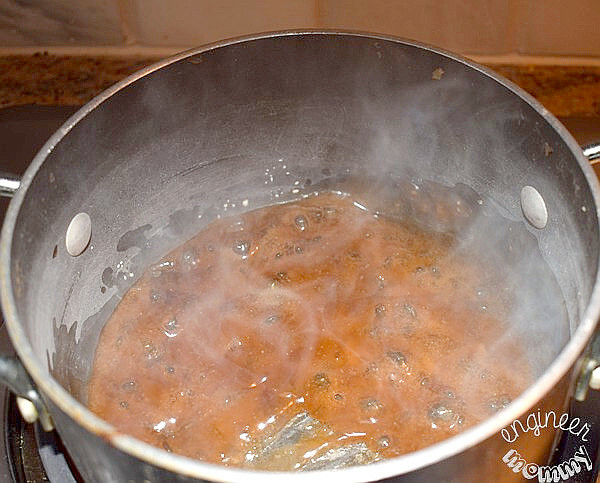 Meanwhile, prepare the balsamic glaze by combining balsamic vinegar & brown sugar in a medium saucepan. Bring to boil and reduce to simmer. Remove from heat once mixture has reduced in volume by half. 4. Spread some balsamic glaze on the slider buns. 5. Top with the cooked pork filet slices. 6. Add a generous heap of mozzarella cheese. 7. Place the caramelized onions on top. Serve warm. Those sliders sound SO good. We are big fans of sliders here in our house and I know my kids are going to love these. I like sliders than burgers because it’s not as its bite size. You can easily eat them and not be too overwhelmed with the size. These look SO GOOD! Also, I just noticed you cut your loin while it’s still in the package. DUH! I totally need to do that from now on bc I struggle to cut and hold on to the darn slippery thing! Oh yum, this would be the perfect meal! I’m pretty sure everyone in my family would love this. I love a quick and easy meal, they’re the best kind. These sliders sound quite flavorful, they’d be great for a busy day. Sliders are always a big hit around our home. I have made pork sliders before and the family loves the. We really like our pork. Love to add cheese and onion to our sliders. 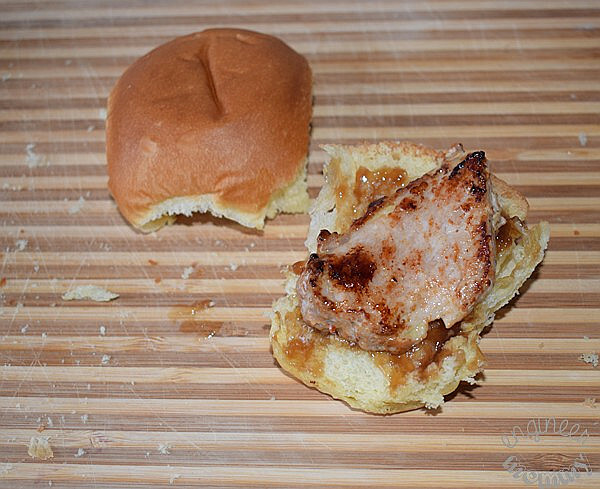 These sliders look very tasty and the pork loin is the perfect size for slicing into sliders. I remember when we had to use rolls for sliders but now some of our favorite bread brands offer slider size buns. Oh, we are having BBQ pork sliders tonight for dinner. This looks really good also. My son would love this recipe. He loves sliders! Can’t wait to make this for him. 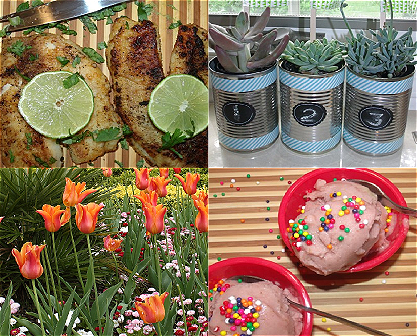 It’s pretty simple to make, perfect for gatherings and parties this Spring and Summer. I love the balsamic glaze! Definitely a flavor that I enjoy. We love to make sliders. We’ve made ham and turkey so far. 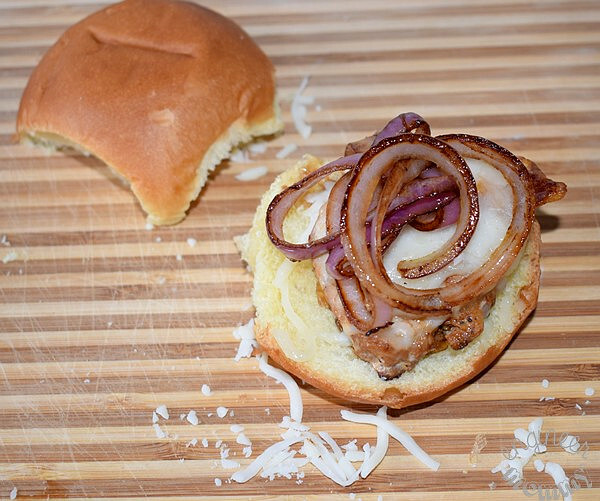 These pork loin sliders look fantastic. I love the sliders craze! I’ve done quite a few different ones, but haven’t tried pork loins yet. Will definitely try them out! It looks lovely and it’s not at all difficult to make. It’s definitely something that I’d prepare if we ever have guests over. I love the combination of the pork and the balsamic glaze! That pork loin looks perfectly seasoned. MMMM I felt like I could taste it through the photos. I bet those sliders were amazing. 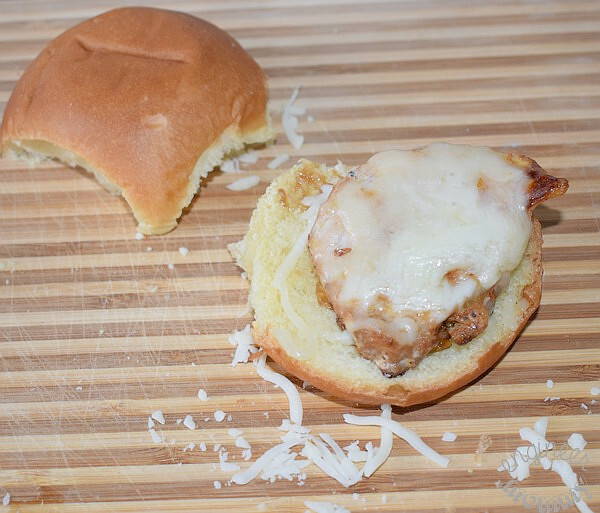 I love good sliders like these but never tried it with pork. I will have to try making this. This is a perfect side on a game night or family get together. The pork looks perfectly cooked very mouthwatering. I would love to add some fries or chip along with it. This looks like a cool recipe. Though we are vegetarians, we can try out with veg ingredients. I like the idea of adding balsamic to the sliders, which I can imagine compliments the cheese beautifully. And it is great that no hormones are added to the loins as well, that must feel like a relief ! What a great idea. I have made Hatfield Smoky Balsamic Pork Loin many times in the crock pot and it’s always a hit. But I haven’t made sliders. I have to try this out.